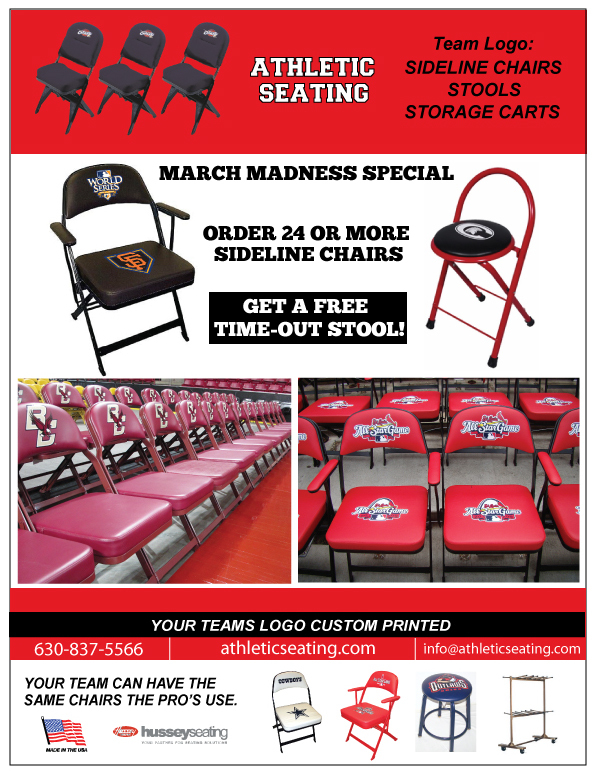 Get a free Logo Time Out Stool with the purchase of 24 Logo Sideline Chairs for a limited time only at Athletic Seating! These fold-able, lightweight stools are great for travel, mid-court time outs, or anywhere! But don’t let the lightweight fool you. They can handle weight up to 300 lbs. These stools come in a variety of colors, and your custom logo is included. We feature the Clarin Model 3400 Sideline Chairs, which are the number one chair in the business. And, they are made in the U.S.A. Plus, backed with a 12 year warranty on the frame. they are built to last. And with Athletic Seating’s exclusive and custom logo printing method, your team’s logo and colors never looked better!